For the past 3 years , we have gotten quite a customer base. Our faithful customer coming back to purchase vintage game items for our site. This is for you ! 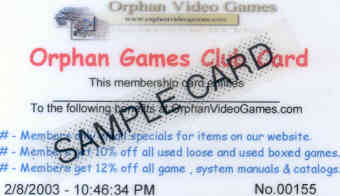 We are proud to introduce the new ORPHAN VIDEO GAMES.COM CLUB CARD ! This card entitles you to benefit of being a return customer ! Each card is numbers and assigned just for you and entered in our database. This way you can enjoy discounts on items on this site and specials just available to you, the card holder ! 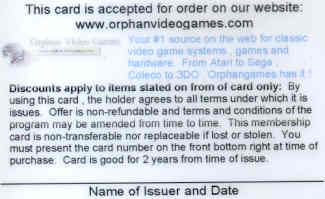 The cards are only available to customers who have purchased from Orphan Video Games.com in the past and present. At this time this card isn't available to the general public, only to new and old customers of our site. To our old customers. In the weeks to come, you will be getting a Club Card assigned to you in the mail. We will be reviewing our past packing list and will be issuing and sending the cards via US Mail. So sit tight and enjoy the discounts of your favorite classic games. If you haven't received your card by March 5th 2003. Please then click the button below so we can review our database and if your in it send you a card ! Thank you to all our pasted customers and future new one !